The reddest poppy in the garden: Actually the only poppy at present, but this plant produces flowers of such an astronomical red that it is really quite hard to know how to draw them. You can’t even photograph them without the camera losing some of the detail and just filling it in in a sort of block red. I suspect it of secretly fluorescing: converting additional UV light into red light too, so that it actually gives off more red light than the eye thinks would actually be possible. Needless to say, I have not done it justice, but I had a go. 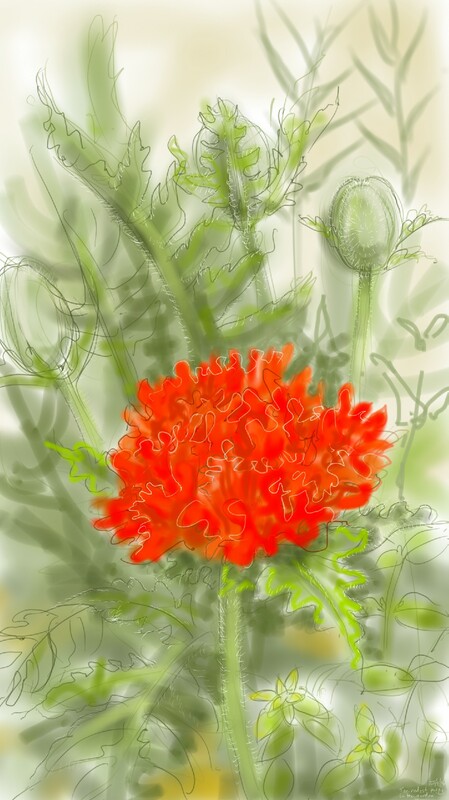 This entry was posted in Plants and tagged art, digital sketch, drawing, illustration, my garden, phone sketch, plant, poppy, samsung galaxy note 3, tablet sketch on April 25, 2014 by Nancy Farmer.